New draftees face the media Watch as draftees Callum Brown, Josh Daicos, Kayle Kirby and Sam McLarty are joined by Peter Daicos and Gavin Brown to face the media on Monday afternoon. 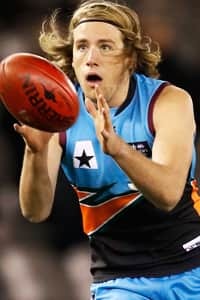 Ruckman Max Lynch joined Collingwood with pick No. 51 in the 2016 Rookie Draft. "Max is very raw after coming from a soccer background. He's been playing football for only four or so years, came in as a bottom ager and worked hard and reaped those rewards this season as a top age player. He was pretty much our No. 1 ruckman for most of the season and for a big bloke he has really good mechanics with his kicking and can win the ball around the ground. Still developing his aerial work, but we saw some significant improvement this year, particularly late in the year where he played well in the Preliminary Final and Grand Final. A bit of a development project but the upside is certainly there," - Murray Bushrangers talent manager Lee Fraser, Inside Football, November 2016.